One of South America’s great natural treasures, the Amazon region, covers countries such as Brazil, Peru, and Colombia. For its summer 2017 collection, Água de Coco by Liana Thomaz researched the traditions, flora, fauna, and architecture of these regions which despite their differences feature the rich cultural heritage of the world’s largest forest. Inspired by the floating homes made of straw on the shores of Lake Titicaca, Peru. The texture of the pieces results from silk fringes in three different hues of gold with bugle beads embroidery in the same tones that recall the natural glow of the local straw. Draws upon the architecture of the colonial houses of Colombia. Sophisticated details, such as pendants and glass bead embroidery form fringes that resemble regional clothing, featuring bare shoulders and frills. The print is live and bright, colors range from the green to the neon pink of the Victoria amazonica flower. Wavy foliage pieces are fluid, come in shades of green and feature pure silk frills, which results in movement and lightness. Green silk cords and pendants finalize the pieces of that family. The diversity of Peruvian corn, its types, shapes, sizes and colors, are represented by this colorful selection, which features pieces embroidered with glass beads in the hues of the print. The shapes are voluminous and fluid. 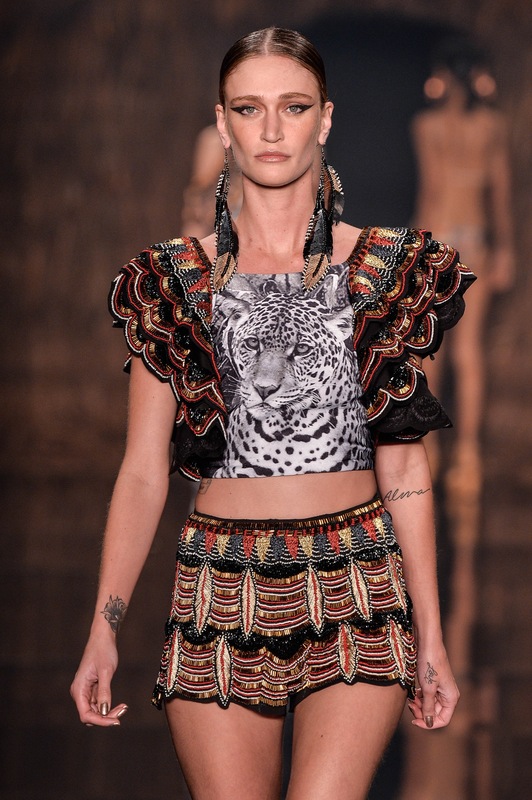 The Amazon wildlife is depicted in a sophisticated way by a leopard print in black and white and by indigenous embroideries inspired by headdresses. The pieces are hand embroidered and include a blend of bugle beads, glass beads, threads, and miçanga beads. Inspired by the indigenous ocas (straw huts), this part comprises pieces covered with metallic fringes made of copper-colored silk threads, featuring voluminous shapes that recall the huts. The rich embroidery inspired by the indigenous crafts is the highlight of that selection. Amazon birds’ color palette is made up of raw basic hues, alluding to straw and emphasizing the multi-colored birds of the Amazon fauna. All embroideries are made by hand with mix of materials that provides the pieces with a wide range of colors and textures. The shapes of that section are rather straight and structured. The Maldives, in the Indian Ocean, is the inspiring scenery for the first Resort collection of Água de Coco by Liana Thomaz – which travels to that group of islands and brings the local tropical richness, linked to its sophisticated beachwear. Thinking about summer all over the year, the brand included one more collection in its portfolio, which this season will feature plenty of colors, and outstanding foliage and floral patterns, in addition to shapes with a sport mood, making of its collection a real show, which takes place in a bungalow near the turquoise water beaches of those islands. Inspired in the islands’ fauna and flora, the sophisticated print features handmade overlays and details, such as trinkets using glass beads and thread. 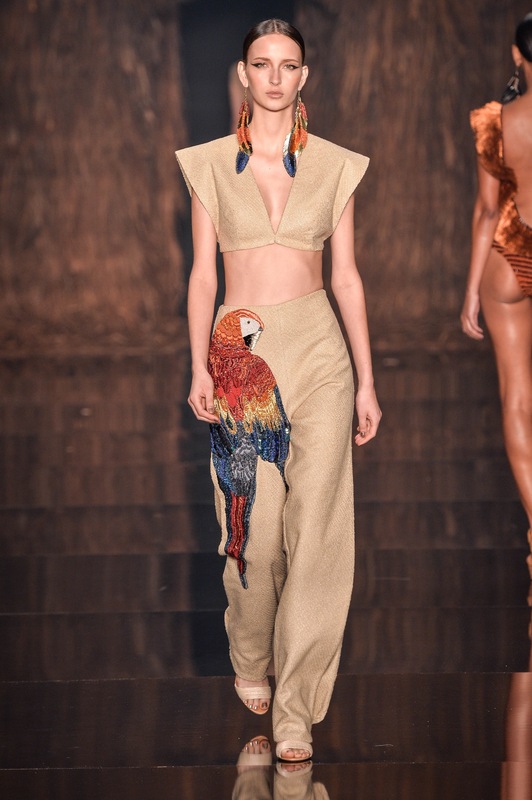 The use of silk brought a satin aspect, conferring a golden shine to the pieces that reminds of the Maldives sun. The fluid shapes have a hint of sleepwear trend. Bias details in caramel leather are the finishing of some pieces. The omnipresent tropical fruit inspired prints with a montage feature, having cubist effects – a new graphic trend that can be seen in the current fabric printing. Made of pure, light cotton, the pieces are very fresh for the summer. There are neoprene overlays with the shape of pineapples and patches of that tropical fruit using embroideries with threads, purls and glass beads. With loose shapes, the sporty vibe shows up to set the tone – along with black tractor zippers as the heavier details, which recall the trend too. The sunset at the Maldives and its reddish tones influenced this family of localized prints, with neoprene overlays, but in the shape of coconut groves, in addition to handmade patches and embroideries. The inspiration on the surf universe can be seen in the shapes and genderless pieces – which also feature sporty zippers. From the exuberance of Maldivian tropical flowers came the inspiration for this family, which also features localized prints, rendering each piece both different and unique. The handmade embroideries are a key aspect, adding much value to the result. The sporty shape appears in pieces that are fully made with rubber bands. Among the novelties are very fluid caftans of the kimono type, as a different interpretation of robes.